Disability Pride Week aims to promote an understanding of disability issues and to mobilise support for the dignity, rights and wellbeing of people with disabilities. It is about breaking the cycle of exclusion and fostering inclusion. We invite you to be part of Disability Pride Week 2017. Register with us and we’ll send you resources and promote your event. In 2016, Wellingtonians Nick Ruane and Rachel Noble created a pilot Disability Pride Week in Wellington. This was a great success with an opening event in Te Marae in Te Papa, tape art workshops, storytelling and a discussion about Wellington through the lens of its disabled citizens. There were numerous calls to repeat the event and to make it nationwide. We are familiar with other pride movements, including LGBTQI, Māori and women, and the incredible strides made when people reject prejudice by demonstrating bold and proud affirmations of who they are. Pride overpowers prejudice. It is about believing in ourselves, our worth and our value, harnessing this to counter the prejudice we experience. To create a culture of respect and human rights, we must first have pride in our own identity and humanity. Disability Pride Week is a step toward this. 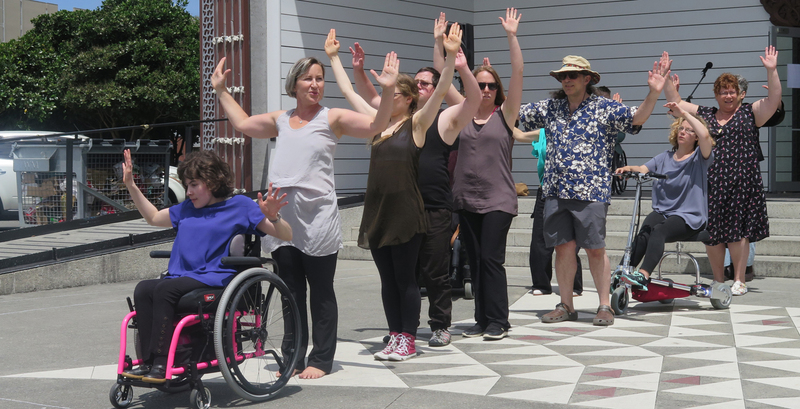 Disability Pride Week is also about protecting and celebrating New Zealand’s taonga, past, present and future, by connecting our heritage and communities with national and international communities. It provides a catalyst for New Zealanders to nnovative become responsible global citizens for an accessible and inclusive society. The week is underpinned by the sharing knowledge and promotion of dialogue to foster mutual understanding. The white words "Disability Pride Week" sit inside a speech bubble. From the top, lefthand corner the pink colour changes to purple then blue as it moves across to the bottom righthand corner. Who do we mean by disabled people? The United Nations Convention on the Rights of Persons with Disabilities (CRPD) is a legally binding international human rights treaty which addresses the rights of people with disabilities. It was adopted on 13 December 2006 and entered into force on 3May 2008. The CRPD created the United Nations Committee on the Rights of Persons with Disabilities. The Committee monitors how states implement the CRPD by making observations on reports submitted by states. The Committee can also offer guidance on how particular elements of the CRPD should be interpreted by writing ‘General Comments’. Article One of the Convention says the purpose of the present Convention is to promote, protect and ensure the full and equal enjoyment of all human rights and fundamental freedoms by all persons with disabilities, and to promote respect for their inherent dignity. This Convention is based on the 1948 Declaration of Human Rights and outlines what these rights look like for our community. New Zealand played a lead role in the development of the Disability Convention with Don McKay as the Chair of the ad hoc committee. Many disabled people in New Zealand had input into its development. Hon Ruth Dyson with Gary Williams, CEO of Disabled Persons Assembly, signed the Convention as the first step for the New Zealand Government to begin the process of realising these rights in New Zealand. The convention embraces a paradigm shift from seeing disabled people as objects of charity and pity to one where we are "rights holders". The UN International Day of Disabled People is commemorated on 3 December each year. The day aims to promote an understanding of disability issues and mobilise support for the dignity, rights and wellbeing of people with disabilities. It also seeks to increase awareness of gains to be derived from the integration of disabled people in every aspect of political, social, economic and cultural life. It is an opportunity to celebrate our lives too. Original generation time 1.3105 seconds. Cache Loaded in: 0.0254 seconds.